Elvira Kudryashova of Style Life Decor discovered Moya Living through KE Design Studio. Kudryashova was in search of something bold and original, so we began with her kitchen and continued our collaboration with seven other designs throughout her home. The kitchen crafted of steel was power coated and paired with her signature, brass. She paired this with an Eggersmann island and in doing so combined materials that were somewhat unorthodox but the result of which was brilliant. Kudryashova cut metro racks and had them brass plated to create open shelving. The bar featured granite walls and counter tops, as well as a built in wine dispenser and ice dispenser. The master suite kitchenette was inspired by brass, as is the bed frame that demands attention in the master suite. Alongside this custom bed frame sits faux alligator and ostrich drawers with onyx pulls and a pure onyx top. Kelly Wearstler was the inspiration for the stacked boxes that make up her vanity. The pulls came from The Mod Shop, a favorite at Moya Living, and we loved the 1930’s feel of this design that still remains inherently modern. 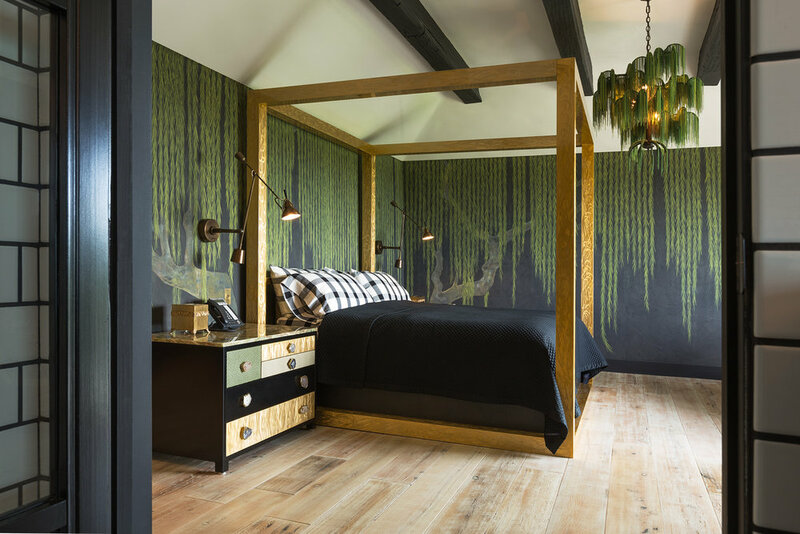 From pop art to hand-painted wallpaper with every power coated detail in between, we love this fun and expected home.